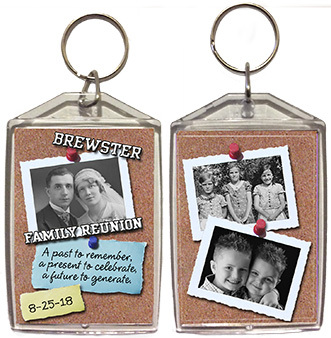 Looking for memorable family reunion favors? Well, we've got a great selection for you! 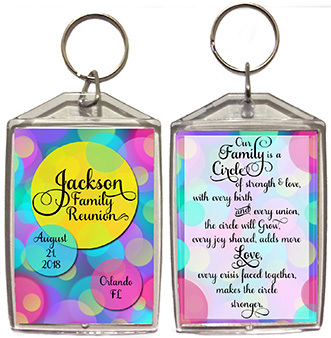 We offer original designs, quality workmanship and great prices on our personalized family reunion favors. You can even add photos or use your family crest (mascot, logo or artwork). We can include a quote, saying or family motto. 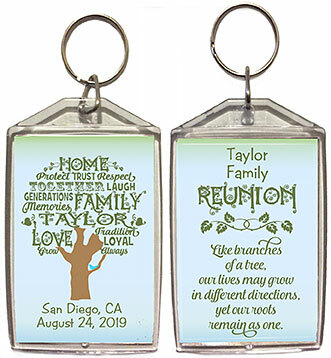 Check out our samples, and let us work with you to create one of a kind reunion favors for your family. 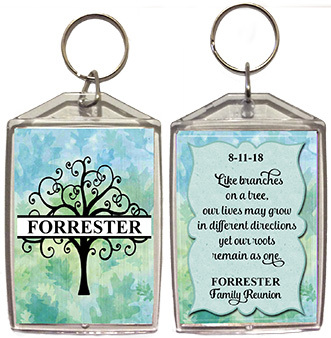 After you have explored this page, please also check out our other pages of personalized favors in different categories. 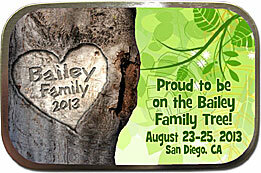 Almost any of our products can be adapted for your family reunion! 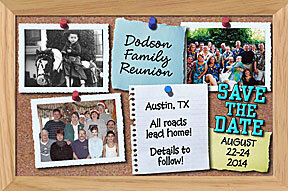 Plus, we have included an assortment of family reunion save the date cards. 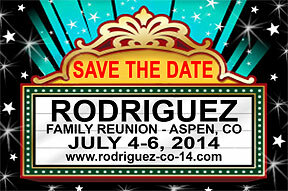 Give your relatives plenty of time to circle their calendar by sending them these unique reunion announcements. And you'll be sure to build their anticipation for this special event. Are you looking for high school CLASS reunion favors? You can find them HERE. IT'S EASY TO ORDER - JUST EMAIL YOUR INFORMATION to us at PhotoPartyFavors@aol.com and we'll email you back a free, no-obligation proof (usually within 24 hours). 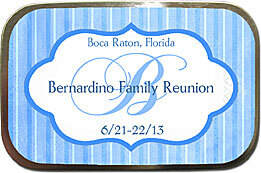 You can find the info we need you to email us with your ORDER right after our design samples on our family reunion favors. 10-49 Bookmarks = $2.25 ea. 50-99 = $2.00 ea 100 or more = $1.75 ea. 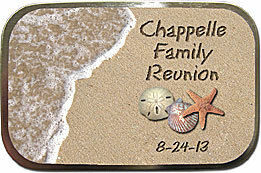 Personalized with your family name & reunion date. and reunion date & place. 10-49 Keyrings- = $2.80 ea. 50-99 = $2.60 ea 100+ = $2.35 ea. 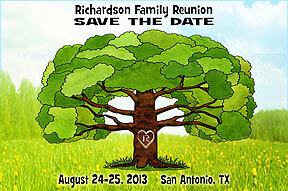 Your family name, reunion date & place. Your family name & reunion date. Your family name, reunion date. Your family name & reunion dace. 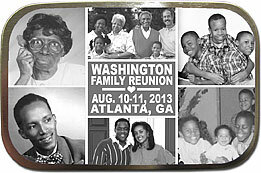 10-49 (2x3 inch) reunion magnets = $2.00 ea. 50-99 = $1.75 ea 100+ = $1.50 ea. Email us 6 family photos, black & white or color. Email us photo of your favorite family photo. 10-49 Mint Tins = $2.95 ea. 50-99 = $2.75 ea 100+ = $2.50 ea. (4x6") 25-49 Save the Dates = $1.99 ea. (4x6")50-74 = $1.75 ea 75-99 = $1.50 ea. (4x6")200+ cards = $1.19 ea. (5x7") 25-49 Save the Dates = $2.99 ea. (5x7") 50-74 = $2.75 ea 75-99 = $2.50 ea. (5x7") 200+ cards = $2.19 ea. Item you are ordering (for example, Family Reunion Bookmarks"). Design you have selected (for example, "Sheltering Tree"). Design names are in bold text under the family reunion samples on this page. If there is enough space for a quote or additional message, please also include that - even if it is shown in the sample. Since each order is custom, we can change the wording! Ribbon color (and 2nd, alternative choice for ribbon color, if your 1st choice isn't in stock) - if ordering bookmarks. Approximately how many you will be ordering. Your full name and shipping address (we alway copy your shipping information from your email and paste it directly into our label program, so there is no chance of typos when it comes time to ship). Your phone number, in case we have questions. Don't forget to attach your photo or photos, if you are choosing photo favors. It usually takes between 24-48 hours after you email us your order information before we email you back a proof of your order. You don't have to pay anything until after you approve the proof. Once you approve the proof and email us that you are mailing your check made payable to Linda Kling, we will send your order to production. 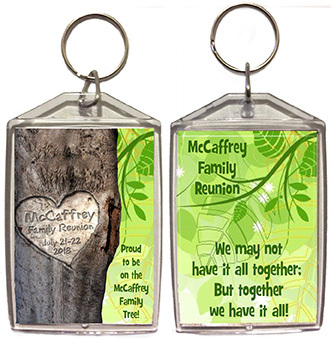 Actual family reunion bookmark size is 2 � x 6 � inches (not including ribbon). Your choice of ribbon color for bookmarks. (Occasionally, our supply runs low on a particular color, so please have a 2nd, alternate choice available). With bookmarks, your design is professionally duplicated onto special photo-quality matte cardstock with your message, and is encased in a clear, soft vinyl (6 mils thick). 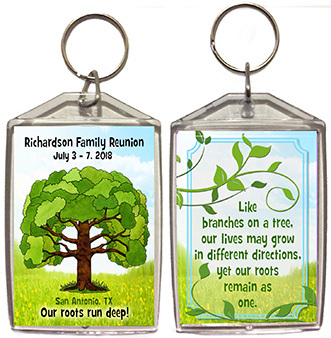 Our double-sided reunion keychains are lightweight, sturdy, high quality acrylic plastic with a strong jump ring attached to connect your keys. 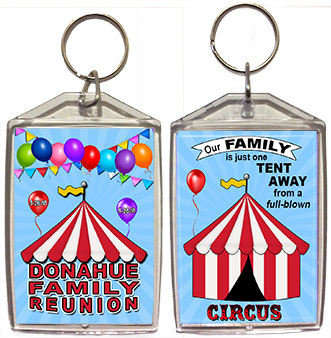 The imprinted area on each side is 2 inches x 2-7/8 inches and the overall size of the keychain (without the attached ring) is 2-3/8 inches x 3-5/8 inches. Our 2 x 3 inch magnets are imprinted onto an ultra-thin, flexible magnet material for a superior glossy photo finish. They have full magnetic backing - now with new stronger, thinner magnets. They are really lightweight, but they are not flimsy, with a 16 ml thickness. 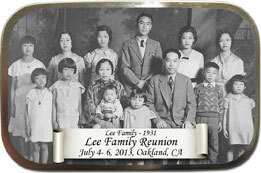 Family reunion unfilled mint size tins are 3.9 inches long by 2.5 inches wide and .875 inch deep, come fully assembled with the photo glossy label already adhered to the top of the tins. When you receive the hinged tins, they are empty, ready for you to fill with your choice of chocolate, candy or anything else you can imagine. For all the information, please see our unfilled, personalized mint tins page. 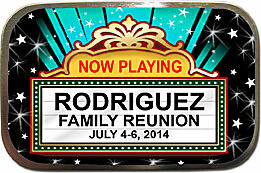 Family reunion save the date cards are available in 2 sizes (4x6 or 5x7), are non-folding cards with the photos, design and message professionally printed on glossy heavyweight (10.5 ml thick) photo paper. Reunion save the date cards come with white envelopes. The envelopes for your 4 x 6 invitations measure 4 1/8 x 6 1/8 inches. The envelopes for your 5 x 7 invitations are 5 1/4 x 7 1/4 inches. We always include extra envelopes with your order. We do not have other envelope colors available at this time. 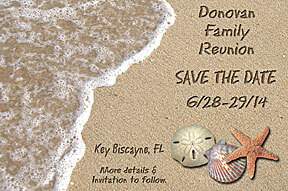 Messages on family reunion save the dates are only suggestions. 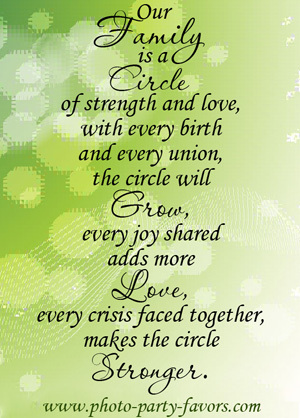 You may change the wording to create your own, personal message. Look at the sample text used in the card of your choice as a guideline to how much text can be used. 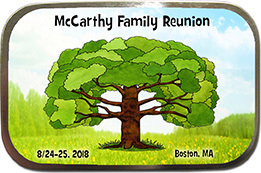 We always email you a proof of your family reunion bookmarkers, magnets, keychains, mint tins or save the date cards within a couple of days of receipt, so that you may check it for accuracy, and we only send your order to production after we have received your approval. 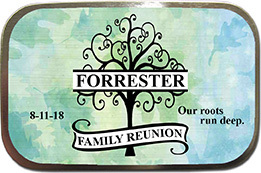 Minimum order for family reunion bookmarks, magnets, key rings or unfilled mint size tins is 10. 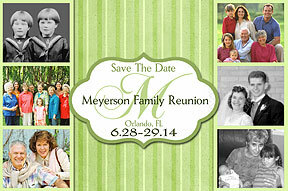 Minimum order for family reunion save the date cards is 25. If you want to use a photo or photos in one of the designs (or family crest, logo, mascot, etc. ), the photo must be emailed to us at PhotoPartyFavors@aol.com. There is NO extra charge to include your photo. If you're scanning or taking a photo, it must be large, clear and high quality. How Long Will It Take? 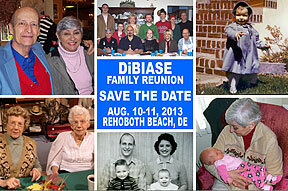 During reunion season (May - September), we are extremely busy! Please allow at least 4 weeks from the time you place your order until the time they are delivered. That doesn't mean it will take that long, but sometimes it does, so try to plan ahead. If you need to receive your reunion favors in less than 4 weeks during our busiest season, please call or email us for availability. Bookmarks $2.25 ea. $2.00 ea. $1.75 ea. Rectangle Double-sided Keychains $2.80 ea. $2.60 ea. $2.35 ea. 2x3 inch Magnets $2.005 ea. $1.75 ea. $1.50 ea. Unfilled Mint Tins $2.99 ea. $2.80 ea. $2.65 ea. 4 x 6 inch $1.99 ea. $1.75 ea. $1.50 ea. $1.25 ea. $1.19 ea. 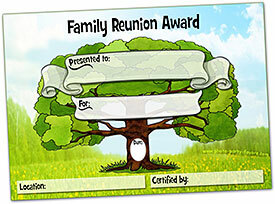 Free, Printable Family Reunion Award Certificates! 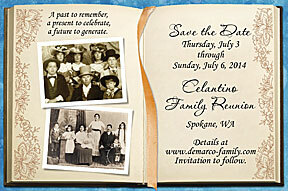 Print as many as you want of these 5 x 7 inch family reunion award certificates. Then trim edges, fill in the blanks with a pen or Sharpie and present to family members. Looking for some ideas for family reunion awards? We're also sharing a list of over 60 category ideas to get you started. 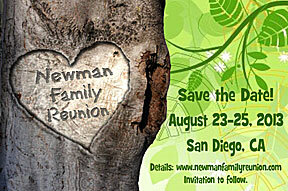 Click here for the family reunion award certificates and ideas. Any questions or comments about our family reunion favors? Send us an email at PhotoPartyFavors@aol.com You can also check our FAQ page for answers to common questions.